Johnson City Chamber of Commerce promotes and/or participates in the following events. Located just off Main Street, March thru November, is a quaint little outdoor market adjacent to the Historic Courthouse square. Featuring art, antiques, clothing, jewelry, handmade treasures, home decor, outdoor furnishings, consumable yummies, seasonal plantings and more! 10-5 each day - weather permitting. The market is located in City Park, which is adjacent to the courthouse square and surrounded by shops, art galleries and restaurants all within walking distance. Download a copy of our market days vendor app. Vendors, please note the required vendor parking for the event. Join us for the annual Blanco County Fair & Rodeo! ​ 42 Domino & Washer Pitching contest. 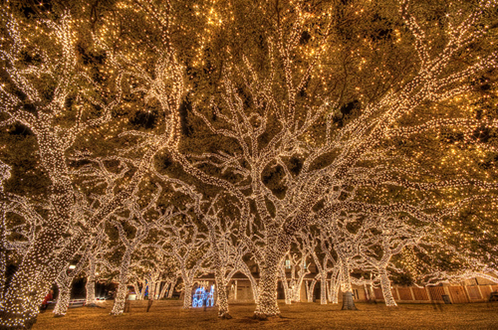 The twinkliest town in the hill country celebrates its 28th annual Lights Spectacular. For the last 28 years, Johnson City transforms itself from a slow-paced, presidential hometown nestled on the banks of the Pedernales River, into a bright beacon of light like a guiding star welcoming visitors with good old fashioned Christmas cheer. Follow the glow and explore Johnson City’s downtown merchants, art galleries and restaurants by foot or by carriage ride. Starting and ending on the famed LBJ Ranch, the routes take riders under majestic live oaks, past historical landmarks that figured prominently not only in the Johnson family history, but also in U.S. presidential history. 10, 30, 42 and 62 mile routes available.